With much excitement, the eagerly awaited Portal 2 launched last night. Those who pre-ordered and pre-loaded the game were the first to delve back into Aperture Science laboratories, their patience rewarded after an uncomfortabe marketing ploy by Valve. To stir up excitement for the game and earn a few extra bucks, Valve decided tp release the game early. I pick my words carefully here. I have neither the evidence to prove Valve’s campaign was a failure nor the gall to call the project an affront to common decency. The marketing stunt, if we can call it that, is unsettling, at least personally, because it fires a spotlight on the cultural power differential between the development studio and its player fan base. The use of cryptic countdowns, alternate-reality games, and consumer involvement in marketing campaigns is not new to any media, videogames included. From a bevy of transmedia marketing experiments, we can conclude at least this: people do not like waiting just to wait again. In 2009, Metal Gear Solid fans were aghast when Kojima’s countdown clock revealed a future date, at which point he would reveal a real announcement. No one likes to get their hopes raised, only to have them quickly deflated. Valve repeated this mistake when their own mysterious countdown trailer revealed, that’s right, another countdown. But there was hope, this countdown had play conditions and a win state! If people downloaded any or all of the games from Valve’s “Potato Sack” indie games bundle, clocking in enough “cpu” usage, Portal 2 would be released early. 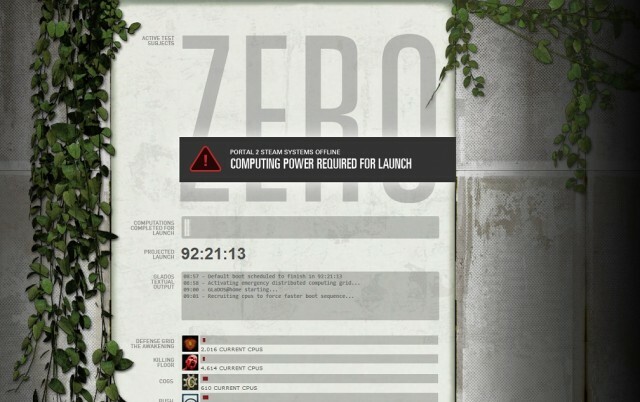 Not only that, but speculation was abuzz about what else the countdown could reveal - did the hidden G-Man image in the site allude to a Half-Life tie-in? As players got to work, disillusionment set in. The countdown clock was moving down so slowly that completing the task would take days. Players left their games idle while they went about their daily business, just to fuel the collective effort. Regardless, it quickly became clear that Portal 2’s early release would occur mid-day Monday at best, just one day before the official launch and right in the middle of the work day. Come Monday night, when many east-coasters were already asleep, Portal 2 was, in fact, released early - about ten hours ahead of schedule. Imagine the momentary panic in the eyes of gamers everywhere when they saw yet another countdown, the game being decrypted. Two points immediately come to mind. First, this is just a sloppy marketing campaign and we should have no qualms about ridiculing the minimal amount of forethought that went into this project. Second, there is really no reason for players to complain. The game was released early, albeit not as early as players had hoped. Likewise, Valve brought some much appreciated attention to several independent designers and games. That being said, both of these points are irrelevant. Regardless of Valve’s intentions, their marketing campaign irked so many people not because gamers were greedy and wanted all their demands met promptly, but because they were confronted with the disparity of power between players and designers. Tying Portal 2’s early release to hours spent playing other games transformed play into labor. The excitement of fans became fuel for an alien machine in which numerical representations of “play” sterilized anticipation. The countdown is not aesthetically organic, it does not convey an appreciation for human elation. The release of Portal 2 as a cultural artifact became implicitly contested. Fans, invigorated by the thought of playing early, were confronted with the calculated power of the corporation who actually claims ownership over the game. Their excitement suddenly seemed derided, or at least ignored. Gamers suddenly became aware of their own powerlessness. Our appreciation for games as an art form can be manipulated - we can be manipulated. This realization is deeply unsettling. Now be a good test subject, run off and play Portal 2, and forget how weak you really are. I don't at all see how it can be considered 'labour'. Apart from a few people who were producing solid work on tracking and estimating the progress in more detail than the GLaDOS@home site did, everyone else was doing one of two things: either playing the indie games and enjoying them (which isn't work), or loading the indie games, leaving them idling in the background, and going and doing something else (which isn't work). In retrospect, given the strength of the "The Cake is a Lie" meme from the previous game (as well as things that transpired in Portal 2, which in the interests of remaining spoiler-free I will not mention), Valve had strongly established that GLaDOS is manipulative and a liar. In this alternate reality game (emphasis on the "alternate reality"), these messages ostensibly came from GLaDOS. She can't be trusted. Valve gave us ample warning about that. Now, one of the things we love about Portal is our tense relationship with GLaDOS. That she acted entirely in character throughout this thing, therefore, was not a black mark against players' anticipation of the game. People chose to feel betrayed by Valve because, to be honest, some people just want something to whine about. We weren't betrayed by Valve; we were betrayed by GLaDOS. And it was brilliant. I mostly have to disagree with this. I feel that this release really set a connection between a community. It connected players together in a effort that was fun. It got developers to have fun putting things into their games, and it is my understanding that it was mostly created by the Indie developers (http://bit.ly/hjYOEx). Also, most of the players were happy for it, just look at the ARG wiki and you can see their thanks (http://bit.ly/icISgX). I am amazed by the generosity of Valve who gave copies of the Valve complete pack and Portal 2 to all the people who stayed in it the whole time and got all the potatoes. I understand how it could seem like an uncomfortable form of marketing, but ultimately, as someone who has been following it all the way, I see it as something that was really great. I saw the campaign as fairly successful. I think given that the indie developers who participated all added extra content to their games, it's wrong to characterize this as a lazy promotion. For the indie devs and people who discovered their games it was a win. Sure, I do agree it was not much of a win for the participants, but it was the first time I personally ever saw an ARG with an actual goal related to the product rather than as an end in itself so there's bound to be bumps there. I do think some people were unhappy, because they had for whatever reason chosen to invest a /lot/ of time and energy in to playing the games or getting potatoes. They're probably a vocal minority (though I do wish I knew how many people that was just for curiosity's sake). Play is only work for people who want to make it work.